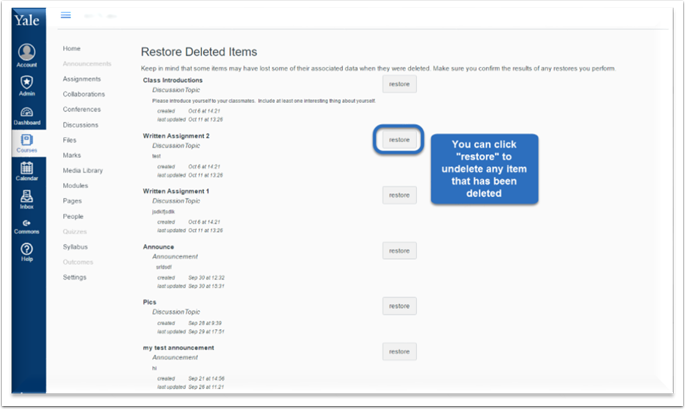 Canvas @ YaleInstructor Guides SettingsHow do I restore deleted items? With Canvas @ Yale, you have the opportunity to restore items that have been deleted, whether intentional or accidental. Every course site in Canvas has a unique URL. By adding /undelete at the end of the URL, you will be brought to a list of recently deleted items which can be restored. Next: How do I create a zip file?